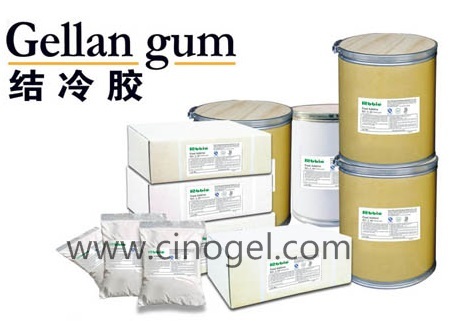 Gellan gum is a fermentation polysaccharide produced by the microorganism Sphingomonas elodea. It has a straight chain structure based on repeating glucose, rhamnose and glucuronic acid units with side groups of acyl groups. Gellan gum hydrates in hot water and the lowacyl form also hydrates in cold water with sequestrants. On cooling, native high-acyl gellan gum gives gels that are soft and elastic. Low-acyl gellan gum gels at very low concentrations using both monovalent and divalent cations to give firm, brittle textures with excellent thermal stability. Combinations of gellan gum can be used to control syneresis and form a range of textures from soft and elastic to firm and brittle. 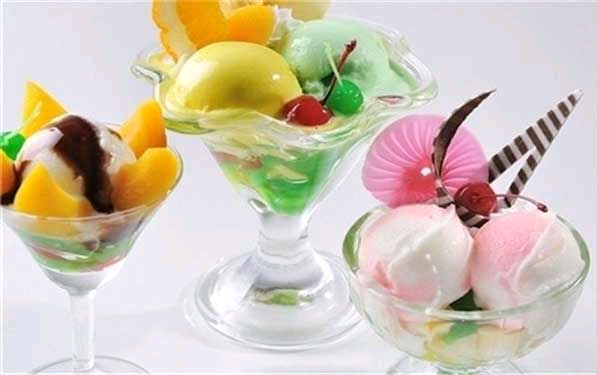 A major food application is water dessert gels, particularly for Asian desserts. Other significant applications include confectionery, dairy desserts and bakery fillings. At levels too low to form a demoldable gel, gellan gum can form fluid gels that can suspend particulates in sauces and dressings and fruit pulp in beverages. (see below,for more please visit:www.cinogel.com). Large sterile fermentation vessels are used to allow the bacteria to convert simple sugars and other nutrients into the gellan gum polysaccharide. 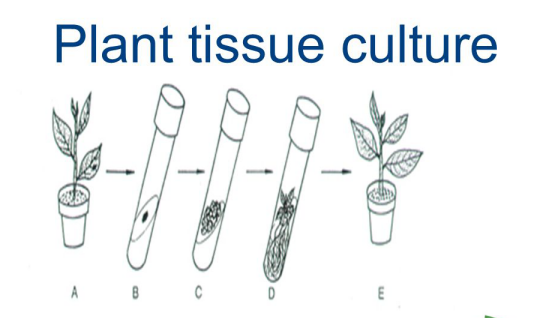 Once the cells have been killed, several different process steps can be followed to produce to four different product types. At present, the low-acyl, unclarified version is not produced commercially. commercial grades can exist depending upon the intended use of the product. Properties such as particle size and gel strength can vary between different grades. Additionally, gellan gum is often blended with other ingredients to make products with properties that are targeted to the needs of specific applications. structure after heating and cooling. If the cooling is done in the presence of cations, the double helices aggregate into long-range networks. When the gum concentration is high enough, this network structure becomes a demoldable gel. The acyl groups on the high-acyl gellan gum help stabilize the double helix, but they interfere with the double helix aggregation. without the interfering acyl groups, forms gels that are very firm and brittle. properties, it is important to distinguish between low- and high-acyl gellan gum types. inhibited by the divalent ions present in most water supplies. This effect makes low-acyl gellan gum easy to disperse in cold water without forming lumps. Subsequently, the gum can be hydrated by adding sequestrants or chelators, such as citrates and phosphates, to control the divalent ions, heat or a combination of both. Hence, the hydration temperature of low-acyl gellan gum can be effectively controlled (see below picture). Without sequestrants, low-acyl gellan gum requires a temperature above about 75◦C (167◦F) to fully hydrate in soft water. 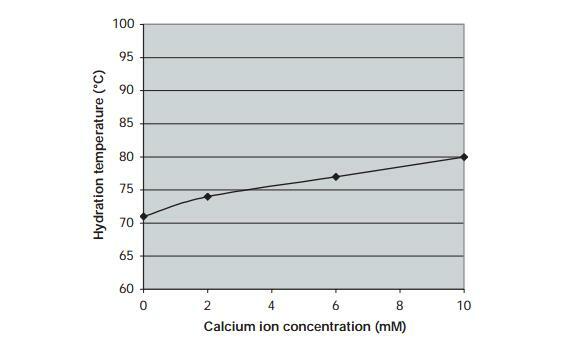 However, it can be hydrated in cold, soft water using 0.12% sodium citrate, as given in Table below. a predominately acid form which is not completely soluble. Therefore, when formulating acidic products, the acid should be added after the gum has been hydrated. sugar levels of 25% or so, hydration proceeds in a normal manner. As the sugar level increases above this point, more heat needs to be applied to fully solubilize the gellan gum. When using gellan gum, it is always better to keep the level of dissolved sugars low until after the gum has been hydrated. After gum hydration, the remaining sugar solids can be added. the gellan gum hydrates. A fine mesh product is needed to facilitate hydration in the presence of sugars. Gellan gum’s sensitivity to monovalent ions increases in high-solids systems, so high sequestrant levels will inhibit, rather than aid, gum hydration. The inhibition effect can be avoided by keeping sodium citrate levels less than 0.2%. sugars can be added to form the final food. describes the gel properties that can be expected in each of the four quadrants. the following 3 pictuers show how pH and dissolved sugar solids interact. the literature published on gellan gum has focused on gels in this domain. Because the pH is not acidic, the carboxyl groups on the gellan gum molecule interact with sodium, potassium, calcium or magnesium counter-ions. This interaction results in a high degree of molecular association and the formation of a long-range network or gel. Gellan gum is an effective gel former in this quadrant, creating demoldable gels at gum concentrations as low as 0.05%. environment. With high molecular mobility, a gel forms quickly upon cooling. The exact temperature of gelation depends upon the cations present and, to a certain extent, upon the cooling rate. The average temperature for gelation is 30–45◦C (86–113◦F) (see above 2nd). 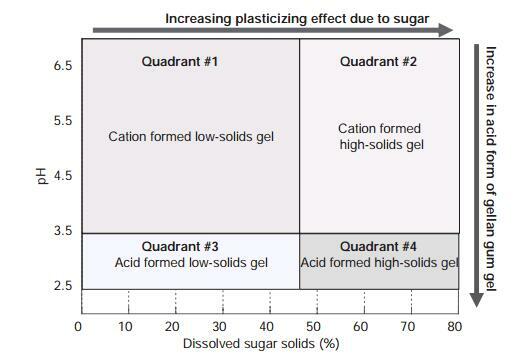 Quadrant 2 in(above 1st)covers gels formed at neutral pH and higher sugar levels. Gels prepared under high-solids conditions include confections, icings and the like. 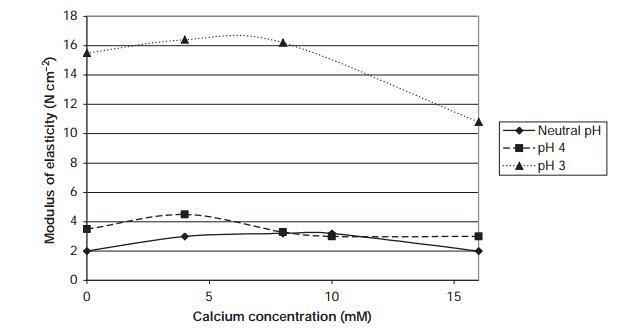 below shows how the strength of these gels varies with calcium level. Compared to the low solids gels in Quadrant 1, these gels are softer and much less calcium sensitive. Because gellan gum is less effective at forming demoldable gels in Quadrant 2, higher gum levels, typically 0.3% or higher, are required. low temperatures, it can take weeks for gellan gum to develop its full structure. Once formed, high-solids gels are softer and more elastic and they have a greater ability to re-heal after being sheared. 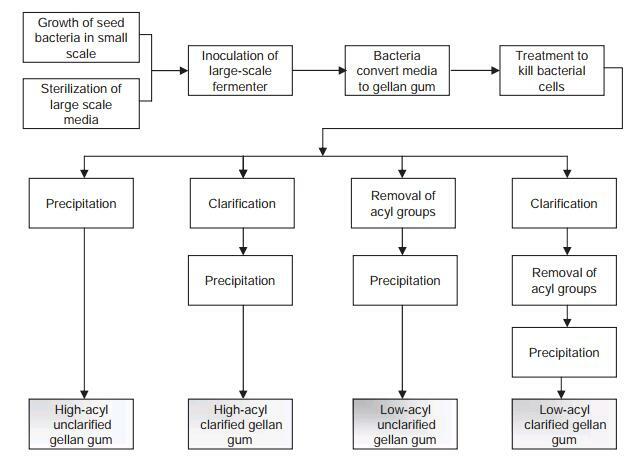 Different sources of sugar solids, such as sucrose, glucose and fructose, affect both viscosity and molecular mobility of the gellan gum molecules, so the exact nature of the dissolved solids has a strong influence on the properties of the gellan gum gel. Sucrose has a more pronounced influence on the set time and gel texture than does fructose or glucose. Sucrose lengthens the set time and softens the gel and it also increases the gel’s ability to re-heal after shearing. 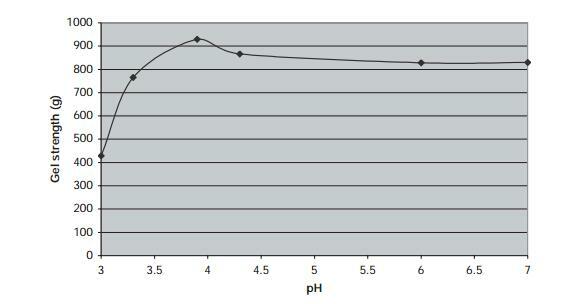 Quadrant 3 represents gels with fairly low dissolved sugar levels and acidic pH values. 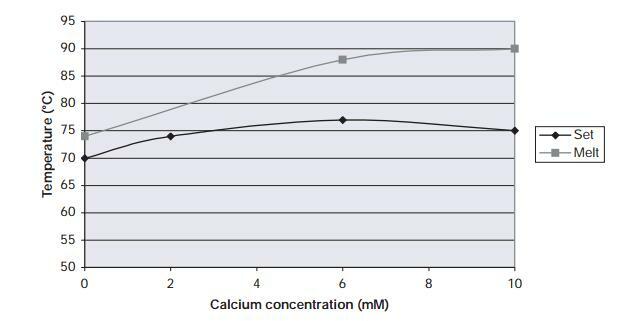 show how calcium ions have far less effect on these gels, especially as the pH is lowered. concentrations of 0.05% or less in this quadrant. gels are firmer but they are quite brittle. The high brittleness of these gels is often perceived as soft and mushy because the gels break under low levels of strain. The gels have slightly more tendency to synerise than do gels at a more neutral pH. Like Quadrant 1 gels, gel formation in Quadrant 3 occurs quickly with cooling. However, acid-induced gelation generally occurs at a lower temperature than ion-induced gelation, and the resulting gels are not as thermostable. In this quadrant, the gels will not re-heal after shearing. above shows that the texture of these gels is relatively insensitive to calcium. As the pH drops below the pKa of the gellan gum, these gels get more and more firm because the gelation mechanism changes from ion induced to acid induced. With the plasticizing effect of sugars, however, the gel textures do not become overly brittle like the Quadrant 3 gels. Because gellan gum is less effective at forming demoldable gels in Quadrant 4, higher gum use levels, typically 0.3% or higher, are required. reduced when sugar solids come from fructose, dextrose or sugar alcohols. 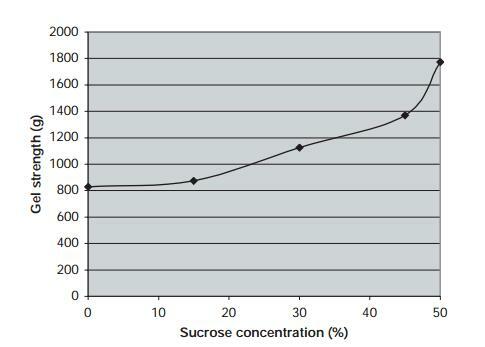 Sucrose, however, increases the gel temperature and extends the gel set time. In most cases, these acid-induced, high-solids gels do not remelt. As the gels get firmer with lower pH, they also lose the ability to re-heal after shearing. small changes in gel properties. 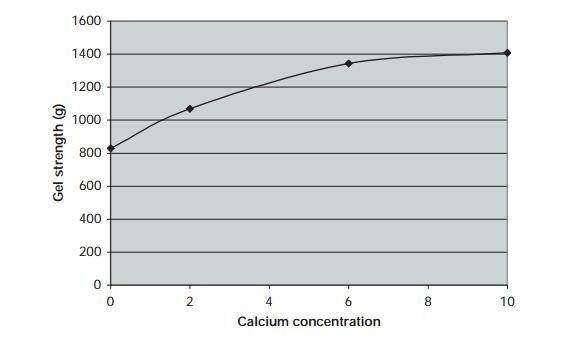 Slightly firmer gels result as the calcium level is increased. gum are needed to form a demoldable gel in high-solids environments. are not influenced by pH. concentration increases. With low ionic strength gels, these two temperatures are within 3◦C of each other. With high ion levels, the difference increases to 8◦C. 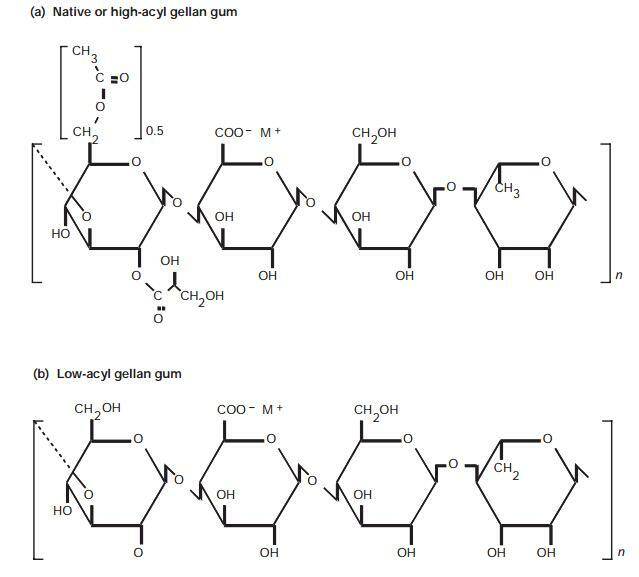 The low ionic strength dependence and the low thermal hysteresis reveal that the high-acyl form of gellan gum forms gels as a result of interchain association, lacking the significant cooperative ion cross-linking of the low-acyl form of the gum. network, the system remains very fluid. These systems are often called ‘fluid gels’. fluid gels exhibit a high elastic modulus, which imparts suspension properties to the system. networks of polymers (Manson and Sperling, 1976; Mao et al., 2000). This structure means that, in most cases, the high-acyl form will set at a higher temperature as shown in previous figures. textures illustrated in Fig. below. Blending gellan gum with other gelling hydrocolloids typically results in gels with intermediate properties. For example, low-acyl gellan gum can be used to increase the firmness of soft, elastic gels such as iota carrageenan, gelatin or combinations of xanthan gum and locust bean gum. 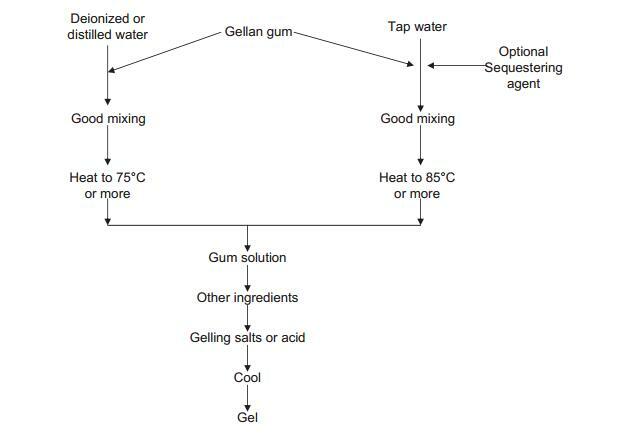 Adding gellan gum to other gelling agents can be particularly advantageous for altering the setting and melting properties of the other gum systems. For example, gellan gum can be used to raise the set temperature of gelatin-based confections and dessert gels. Synergies with gelatin, carrageenan and xyloglucans have been reported in the literature (Blecker et al., 2000; Loh et al., 2002; Ikeda et al., 2004). However, these synergies are likely based on ionic effects and volume exclusion rather than on direct gum interactions. In other cases, it may be desirable to mix gellan gums with other gums to take advantage of their functional properties. For example, gellan gum can be mixed with gelatin to improve the heat stability of gelatin gels. Additionally, confectionery products, such as gummy candies, can be made without gelatin by using mixtures of carrageenan with gellan gum. Gellan gum first received approval for food use in Japan in 1988. It is now approved for food, nonfood, cosmetic and pharmaceutical use in the USA, Canada, Australia and many other countries in Latin America, South America, Asia and the European Union. Gellan gum first appeared in the USP/NF first Supplement 1 April 2004 USP 27/NF 22. Food and Drug Act (Division 16, Table IV, G.2) and the Japanese Specifications and Standards for Food Additives (JSSFA). intake (ADI) of ‘not specified’. On food labels, high-acyl and low-acyl gellan gum or any combination of the two may be declared under the name of ‘Stabiliser: E418’ or ‘Stabiliser: Gellan Gum’ in the EU. Within these broad categories, a number of specific applications of gellan gum are discussed in greater detail. The most common commercial use of gellan gum is creating water-based gels. bean gum, targeted for a dessert gel texture, is commercially available. gel texture that is similar to the texture of a gelatin dessert gel. acid, however, allows larger batch sizes and more flexibility with pasteurization conditions. enhance the flavor impact of the gels. melting it. Gellan gum can also be used to make heat-stable colored beads or shaped novelties that can be used as inclusions in a clear gel matrix. be sucked through a straw. Others will be crushed and squeezed out of a pouch. In many Asian countries, drinking jellies are consumed simply for their interesting textures. Increasingly, however, gellan gum drinking gels are being formulated to provide enhanced nutrition or nutraceutical benefits. Sports gels are an example of such a product. They are typically packaged in pouches with tear-off tops for consumption while exercising. down the throat without leaving a sticky coating. and increasing the lubricity of the gel. Typical gellan gum use levels range from 0.05% to 0.1%. However, drinking jellies with different textures can be formulated by adding other gums, including high-acyl gellan gum. and provides heat stability for pasteurizing or retorting these products. in water gels. Many different applications are found in the bakery segment. found in such products, low-acyl gellan gum does not readily hydrate in cold water. Using low-acyl gellan gum in a bakery formulation does not increase the batter viscosity because the gum does not hydrate immediately. However, gellan gum hydrates in the oven during baking, so it provides moisture retention and shelf life extension in the final baked goods. Gellan gum finds most of its use in dry mixes formulated to produce thick batters, like brownies, where excessive viscosity would impede batter spread in a baking pan. The textural effects of gellan gum are obtained at low use levels, typically ranging from 0.08% to 1.0% gum. 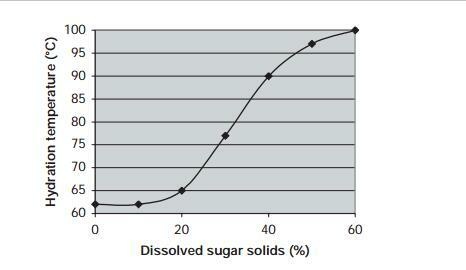 high-solids fillings have in excess of 65% soluble solids. bake stability of low-solids fillings. High melting temperatures are obtained when the gels are set by calcium cross-linking. Used alone, low-acyl gellan gum creates a firm brittle texture that is difficult to pump or spread. However, when used with modified starch, a smooth pumpable texture with good flavor release and heat stability can be obtained. Typical use levels for gellan gum range from 0.08% to 0.3%. 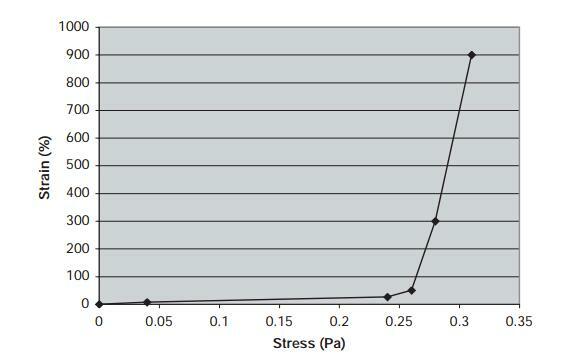 and heat stability of the filling. range from 0.25% to 0.40% gum. temperatures. Formulating gellan gum fillings with high levels of calcium at low pH can result in pregelation. Because of this, most medium solids fillings with gellan gum are formulated with high fructose corn syrup because fructose tends to lower the setting temperature. With higher levels of fructose, the gels are firmer, but starch is usually needed to provide a smooth texture. bars because it can be hydrated directly in corn syrup or glycerin. The bulk composition of glazes, icings and frostings is undissolved powdered sugar. Stabilizers are effective only in the saturated sugar syrup that glues the particles of sugar together. viscosity develops. For frostings, it is best to shear though the set point. Cultured dairy foods are based on the fermentation of milk. Typical products include yogurts, sour creams and cheeses. Gelatin is commonly used to stabilize many of these products, but it is not acceptable for consumers following vegan, Kosher or Halal diets. cultured directly in a serving-sized cup, which may have fruit on the bottom. Stirred yogurt is cultured in a large vat and, after fermentation, the curd is stirred with a fruit preparation and deposited into a cup. Both low- and high-acyl gellan gums can be used in a stirred yogurt, but cup-set yogurts are made only with high-acyl gellan gum. Low-acyl gellan gum creates a lumpy texture after culturing that requires mixing to create a smooth texture. Gellan gum is typically added to the raw milk prior to homogenization and pasteurization. of low-acyl gellan gum must be limited to less than 0.06% or a grainy texture will result. High-acyl gellan gum can be used at up to 0.1% gum before excessive graininess develops. or starch can be added to build a heavier body if desired. Sour cream production is analogous to yogurt, but the fermentation includes butterfat. Shelf-stable, ready-to-drink (RTD) juice beverages are steadily growing in popularity. However, one drawback is that many juices suffer from both juice cloud settling and pulp separation during storage. mouthfeel that is light and refreshing when compared to other stabilizers. Gellan gum can stabilize beverages with a pH as low as 3.0. Gellan gum has low protein reactivity which makes it compatible with a wide variety of juices. 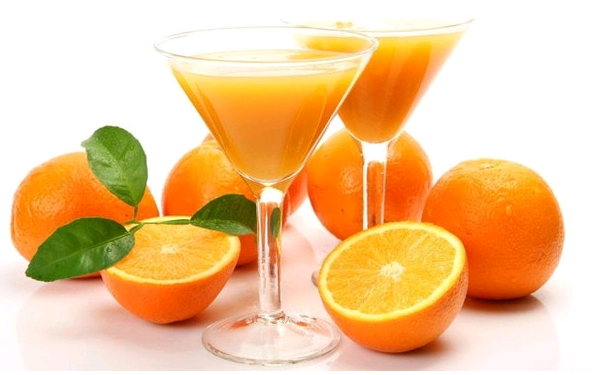 Gellan gum is easy to disperse and hydrate and so it can be used in most juice processing plants without having to add special mixing equipment. special blend high-acyl gellan gum and pectin is commercially available for this application. blend should be used at levels from 0.25% to 0.30%. gum does not have the same synergy with milk, but its independence of milk proteins allows it to be used in products with low milk protein and in systems with low-quality or heat-damaged proteins as will be found in spray-dried milk powders. to its suspension properties. Standard grades of high-acyl gellan gum may also develop off flavors in neutral pH, long shelf life milk systems. Consequently, CINOGEL gellan gum has been specially developed and standardized as a beverage stabilizer for use in neutral pH, long shelf life milk systems without developing off-flavors with storage time. synergistic interaction with soy protein, so higher levels of carrageenan and higher viscosities are needed to fully stabilize the beverage. High-acyl gellan gum functions independently of soy protein type or concentration. This independence is particularly advantageous because the types of soy protein vary from ground whole beans or concentrates and isolates. A special grade of gellan gum has been specially developed to work as a beverage stabilizer in soy protein systems. made with 0.35% gum, but use levels around 0.75% are needed to produce a firm jelly. absence of divalent ions. Unsequestered divalent ions will create a grainy texture during cookup. It is also difficult to add divalent ions to a high-solids gellan gum solution and control the gelation. Therefore, it is typical to hydrate the gum using low levels of sequestrants, such as sodium citrate, and then to use acids to set the gel after cooking. 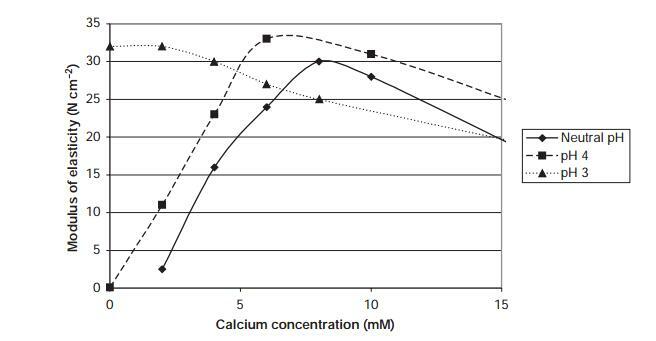 The gel texture is largely controlled by the pH, but calcium released from the sequestrant at low pH will raise the set temperature and shorten the set time. By controlling both pH and calcium, it is possible to obtain a variety of textures and setting profiles. Gellan gum can be used to improve the functionality of other hydrocolloids in confections. Confections made from starch can take several days to develop a demoldable texture. Adding a small amount of gellan gum to a starch formulation significantly reduces the set time, so the gels can be demolded on the same day. Gummy confections made with gelatin also benefit from the addition of gellan gum. Gellan gum increases the heat stability so that the individual candy pieces do not melt together when exposed to a warm environment. However, gellan gum is used in a few additional fruit applications, including low-solids jam and yogurt fruit preparations. With increased consumer interest in nutrition and diet, food manufacturers are continually challenged to create high-quality, low-sugar food products. This is particularly true in the development of imitation jams or spreads which cannot rely upon sugar and corn syrups to provide body and texture in the final product. The challenge for manufacturers of these products is to develop the necessary physical properties of set, spread and stability, while maintaining natural fruit flavors and colors. Pectin has long been used in the manufacture of jams and jellies, but its gelling mechanism requires some sugar and a relatively low pH. jams to be formulated without sugar. like starch. With a high setting temperature, high-acyl gellan gum suspends fruit at a use levels from 0.08% to 1.0% gum, making it one of the most cost-effective stabilizing systems available. Gellan gum can also be in sauces, films and adhesion systems. to suspend herbs in the aqueous layer. reduction of fat in the final product. textures and properties by making products with a different acyl content. gum with significantly greater molecular weight. Gellan gum with exceptionally high gel strength would result from the higher molecular weight. This material would make gellan gum more cost-effective in many applications and it would also be expected to expand gellan gum’s functionality into new applications .